Parthenon Prints was started in 1979 by the Harris family. We are located one mile from the Bay County International Airport and minutes from the beautiful beaches of the Gulf of Mexico in Panama City, Florida. Specializing in volume runs and the printing of flame retardant polyesters, Parthenon Prints offers rotary screen printing of fabrics and wallcoverings of up to 12 screens. 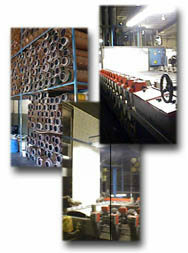 Fabric preparation and dyeing services are also available. Whether your business requires upscale hand printed linens, rotary screen printed fabrics, or screen printed flame retardant polyester, we can be of service to you. If you need to import color or design onto textiles or wallcoverings, please call us! 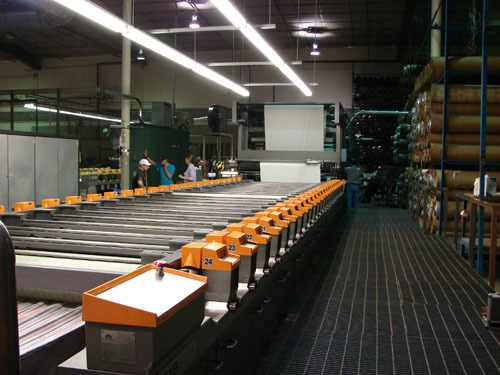 Parthenon Prints utilizes a 12 color Stork Rotary for the printing of textiles consumed mainly by the home furnishings trade. While the concentration has been on natural fibers, we also wet-print Trevira, an inherently fire-retardant polyester. This product is used predominantly by the contract and hospitality markets. The many new fabric styles that have been developed with Trevira, combined with our versatile printing methods have resulted in a very sophisticated product being offered to a market that had been previously limited in design and color flexibility. Most recently our company has ventured into the market of outdoor furniture. The parameters to accommodate the requirements for this product are stringent. Lightfastness and resistance to mildew and abrasion are the primary concerns. Parthenon Prints has developed a product that adheres to the industry's specifications yet is as aesthetically pleasing as any designer home furnishing fabric. We are always looking for new challenges and new ways to utilize our rotary fabric capabilities. Our new 24 color rotary printer is now up and running! Click the picture to watch a movie of it in action, or right click and choose "save as" to save it. A significant portion of Parthenon Prints' capacity is dedicated to wallpaper printing. Our twelve color Stork Rotary print machine combines the look of handprinted wallpaper with the precision and accuracy of modern machinery. We produce a strippable, scrubbable vinyl wallcovering that is available in two weights. We have also developed a non-vinyl product that displays durability characteristics comparable to vinyl. The twelve color capacity of our paper printer complements our fabric printing capability and we specialize in matching one product to the other. We also print, slit and package borders. 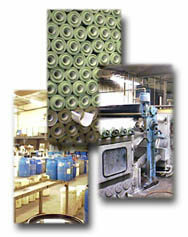 All our product is offered on prepasted or unpasted substrate. The art of dyeing fabrics is an ancient one and has evolved into an efficient science. With the advent of pad/batch dyeing we are able to utilize the colorfast properties and wide color range of fiber reactive dyes while being able to offer custom color matching in as little as one hundred yard minimums. Our dyeing program is currently limited to natural fibers but synthetic dyeing is currently under development. Often the creativity of the textile designer supercedes the capabilities of mechanized print methods. 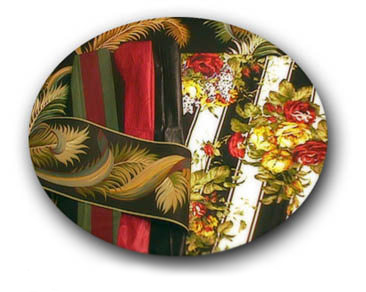 To overcome some of these limitations Parthenon Prints offers through Theonne Fabrics handscreen textile printing. The advantages of this type of printing are exciting. The first is that there is no limit to the number of colors that can used in a design. Often we print patterns comprised of 26 or more colors! 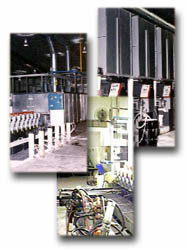 Another feature of hand screening is that there is virtually no constraint to the size of the repeat. This versatility greatly enhances the designer's options. The handprint system is not designed for volume; as we print orders as low as fifty yards. We offer this method of printing to accommodate the outer limits of the designer's imagination often resulting in a collaborative pioneering of new and innovative techniques. Contact us for information on a career in printing wallpaper and textiles. Visit our sister site - New London Textile.